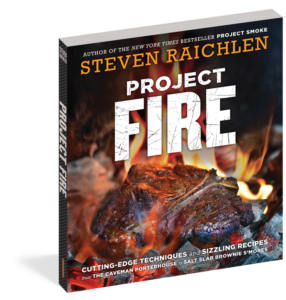 Equipment: Can be grilled over charcoal or gas. You also need a salt slab for grilling and 1 cup unsoaked wood chips. Step 1: Brush or scrape the grill grate clean; there’s no need to oil it. Set up your grill for indirect grilling and heat slowly to medium-high. Gradually heat the salt slab at the same time. Step 2: Lay the slivered mint leaves atop the brownies or sprinkle the brownies with creme de menthe, if using. Lay a square of chocolate on top, and top with a marshmallow. Step 3: Arrange the marshmallow-topped brownies on the hot salt slab. Add the wood chips to the coals or to your grill’s smoker box and lower the lid. 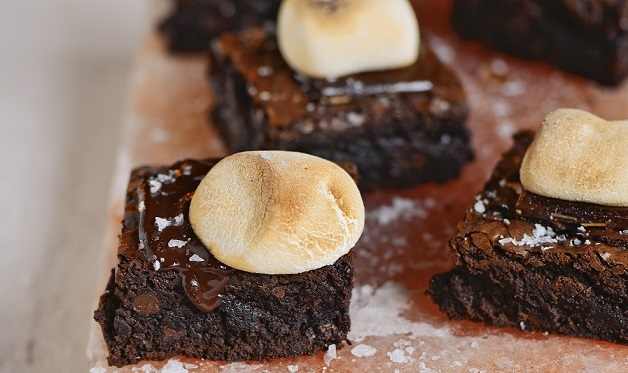 Smoke-roast the s’more brownies until the marshmallows are sizzing and browned, 6 to 10 minutes. Transfer to plates or bowls or serve them right off the salt slab, sprinkled with flaky salt, if using. Do not make this recipe in cold weather. Hot salt slabs have been known to crack or explode when exposed to cold air.